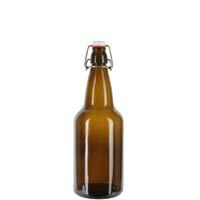 These 500ml EZ Cap homebrew beer bottles are a fun and convenient way to store and share your home brewed beer. The amber glass bottles have smooth, slightly tapered sides that are stylish as well as functional, and flip-tops that make capping quick and easy. Includes 6 complete flip tops that are packed separately. Case of 6 bottles. Boost brand recognition by stamping your bottles with your company's logo. With our streamlined print process, we'll keep you posted as we make your bottles to order and provide the attention to detail and industry level designs you require. 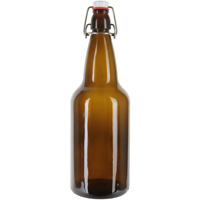 The printable area on the bottles is an extra large 8.5" x 2.25" - A template can be found in the Info & Guides section. 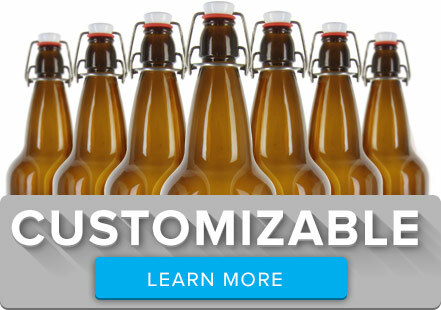 Minimum order for customization is 72 bottles.